The Hawks headed to Chariton last Tuesday and earned their first dual win since their home meet on Jan. 12. L-S junior Carson Dunsbergen was finally back in action after battling a shoulder injury for most of the season and did well for the team, going 2-1. The Hawks faced Chariton first, where they had some good matches and won 35-32. Sophomore Ty Breeden earned some easy points when he took a forfeit at 126. Next was junior Josh Dunsbergen, who lost by tech fall at 132 pounds to sixth-ranked Gabe Ruepke. At 138, senior Caden Dunsbergen lost 4-2 to Adrian Hill. Back in action finally was Carson Dunsbergen at 145, and he won by tech fall. Cayden Johnson received a forfeit at 152. Weight class 170 featured senior Bryson Barnett, who won by pin in 1:43. Next for the Hawks was Aaron Van De Krol, who pinned Jordan Jackson in 0:29. 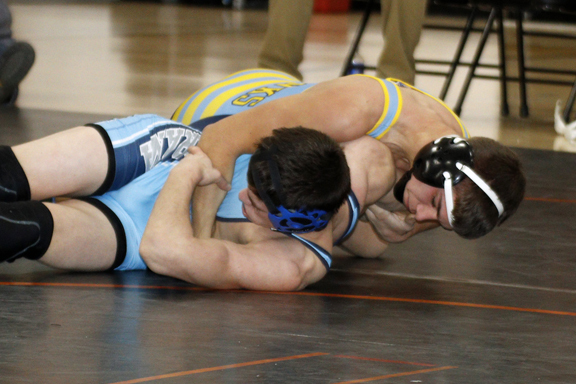 The final victory for L-S was freshman Jacob De Hoedt’s win by forfeit at 106 pounds. Next up on the Hawks’ list was Eddyville-Blakesburg-Fremont. L-S ended up losing to the Rockets, 66-18. First up again was Breeden, who lost by fall to Tayton Ricard in 5:40. Caden Dunsbergen won by fall over Mason Roberts in 1:46. Carson Dunsbergen then lost to Dakota Boyer by fall in 1:48. The Hawks’ next win came when Johnson pinned Brayden Black in 1:42. Barnett lost by fall to Gaige Berryman in 2:32. Van De Krol was pinned by Matt Cobler in 4:46. De Hoedt got another easy win by forfeit. J. Dunsbergen wasn’t able to wrestle in this dual because he broke his nose against Chariton. Martensdale-St. Marys was next for the L-S wrestlers. The Hawks were edged out, 39-36, by the Blue Devils. First up was Caden Dunsbergen, who won by fall over Dillon Fouts in 0:47. The Hawks won and lost several forfeits until DeHoedt pinned Thomas Gyles in 0:59. The final match had Breeden losing to Vincent Girardi by minor decision, 12-10. At 126 pounds, sophomore Ty Breeden holds down his Panther opponent at last Thursday’s triangular at Pleasantville. A couple days later, the wrestlers headed down to Pleasantville for a triangular dual against Pleasantville and Panorama. With only six wrestlers in the Hawk lineup due to injury and illness, they came up short in both competitions. The Hawks gave up 42 points in each dual due to open weights. L-S started off the night against the Panthers of Panorama, losing 63-12. At 106 pounds for the Hawks, De Hoedt took a forfeit. Next was Breeden, who fell to Noah Kirtley by getting pinned in 3:16. Caden Dunsbergen wrestled at 138 pounds and pinned Jacob Holwegner in 1:16 for his first win of the night. At 145 pounds, Carson Dunsbergen fell to Kaleb Stodgill in a close match, 6-4. Johnson fell to seventh-ranked Tyler Van Houten, 9-3, in a very intense match. “I felt pretty good about this match. Being able to wrestle tough competition just makes me better in the long run. It pushes me to be better,” said Johnson. The heaviest L-S wrestler was senior Bryson Barnett at 170 pounds. Barnett fell to Gunnar Grunsted by getting pinned in 1:36. “We actually wrestled pretty decent even though we came up short both times. We need to get in better shape and prepare for the post-season,” said assistant coach Billy Cupples. The Hawks then wrestled against Pleasantville, losing 54-18. This dual lasted a total of 12 minutes with only four matches taking place. All four matches did not go out of the first period. De Hoedt took another forfeit at 106 pounds. Breeden then got pinned by Alex Bartels in 0:33 at 126 pounds, followed by a forfeit to Caden Dunsbergen at 138 pounds. Carson Dunsbergen got a pin in 0:26 against Wyatt Clark at 145 pounds. Next up, Johnson fell to fourth-ranked Sawyer Phillips in 1:34. This was Johnson’s second top 10-ranked opponent of the night. To finish out the night, Barnett fell to Cael Lester by getting pinned in 1:26. 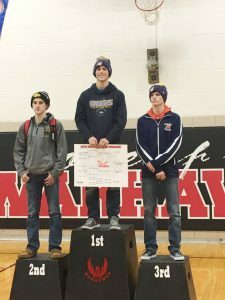 Senior Caden Dunsbergen stands at the top of the podium as 138-pound champion at the SICL Conference tournament where he was seeded fourth. The busy week culminated with the SICL Conference tournament at North Mahaska on Saturday, Jan. 28. As a team, L-S earned fourth overall. Caden Dunsbergen came away as conference champ at 138 pounds as the only Hawk to win a weight class. He pinned Shaun Clark of North Mahaska in 4:38, Adam Teed of Colfax-Mingo in 3:45, and Caden Fontinel of HLV in 4:49 in the championship match. “It felt great to win conference. This season has been a struggle so far since I missed last year, but winning was a boost of confidence,” Caden said. At 145 pounds, Carson Dunsbergen finished second. He pinned Jesse Fritz of Sigourney in 0:32 and won a 6-4 decision over Cole Widmer of Montezuma. In his final match, Carson was pinned by BGM’s Dalton Roberts. Junior Sage Zylstra was back competing and placed second in the conference. He pinned Andrew Fisher of English Valleys in 1:30 and beat Alec Schuster of Sigourney by a 9-6 decision. In the match for first place, Zylstra fell to Iowa Valley’s Jacob Krakow by pin. Dunsbergen was back in action and finished third on the day at 132 pounds, going 2-1. He pinned BGM’s Jordan Kriegel in 2:48 to start the day and then fell to Nick Ives of Sigourney by a 6-3 decision. J. Dunsbergen recovered by pinning Keaton Annis of English Valleys in 1:04 and Kriegel again in 3:43. At 152, Johnson also finished the day in third. He beat Iowa Valley’s Breven Platt by a technical fall and then fell to North Mahaska’s Griffen Molenburg. Johnson rebounded with a pin over Sigourney’s Cian Borra in 0:25 and also beat Montezuma’s Jaedon Probasco by disqualification. De Hoedt went 2-2 to place fourth at 106. He pinned Trey Striegel of Sigourney-Keota in 2:51 to get to the third-place match, where he fell to Tanner Mihal in 0:36 to place third. Fourth place also went to Breeden at 126. He beat Dane Fisher 10-4 to get to the third-place match, but then got beat by Gavin Patterson of Iowa Valley in 4:23 to place fourth. Both Barnett (170) and Van De Krol (220) finished the day in fifth. L-S places first or second as a team at sectionals this week, they will qualify for the regional dual meet on Tuesday, Feb. 7. Go Hawks!